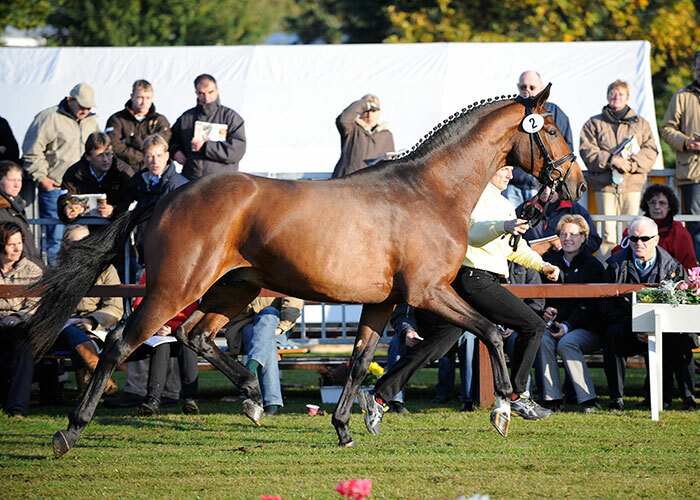 The sire Lissabon, gave proof of his exemplary talent for both dressage and jumping on the occasion of the 30 day test in Munster-Handorf in 2002 when he became undisputed winner in a group of strong competitors. He won several qualifiers for the Bundeschampionat and participated twice successfully and was placed with the best in advanced class when 7 yo. The dam, State Premium mare Marquesa has famous full brothers named Maurice, and Mackintosh, both successful up to advanced level dressage. 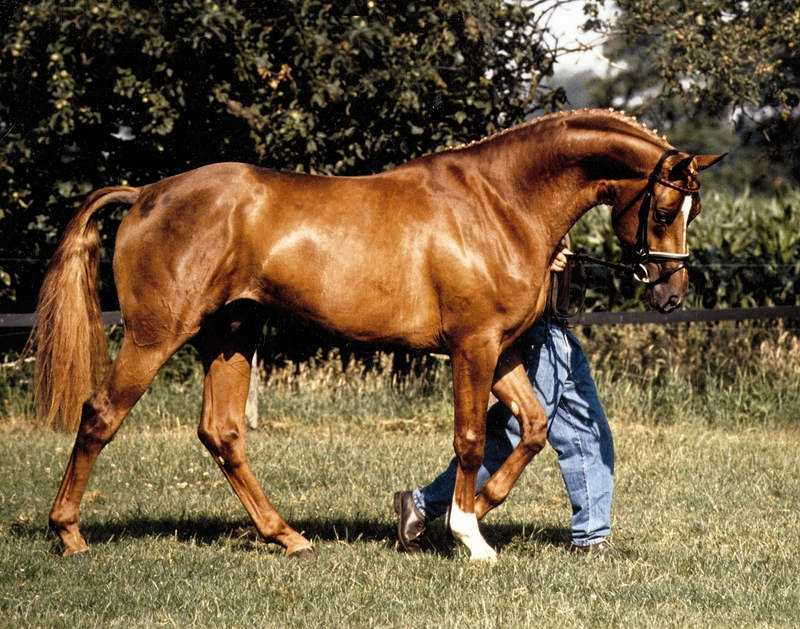 She was successfully bred several times with Graf Sponeck and produced beside Grafin Sponeck (dam of the licensed Shalimaro) also licensed chestnut stallion Giuliano, winner in jumping at the stallion performance test in Adelheidsdorf in 1995 and successfull jumper under Heinrich Bormann. The damsire Matcho AA was the 1992 stallion performance test winner in Adelheidsdorf and bred at Celle, his offspring enjoyed great popularity because of the pronounced rideability and good character and because they were good in both disciplines. Real performance guarantors Garibaldi 11, Diskant, Servus and Abhang 11 are found in a row in the background like the well-known “pearls on a string”. 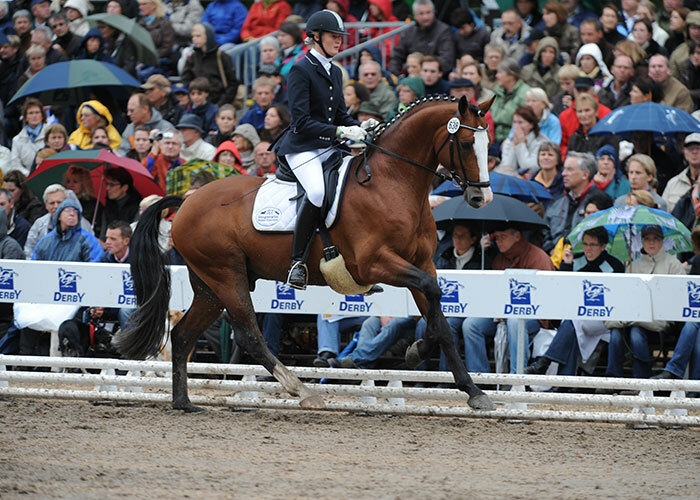 Lissaro van de Helle was awarded a premium in the jumping lot on the occasion of the 2007 Hanoverian licensing in Verden. He won several times in tests for young riding horses and in 2008 was finalist at the Hanoverian Championshp for riding horses in Verden. In the same year he became the towering winner in the qualifier and final at the Bundeschampionat for 3 yo stallions in Warendorf and then dominated the 30 day test with top scores in all disciplines in Munster-Hahndorf after he was licensed for the Hanoverian Society as a 2.5 yo. 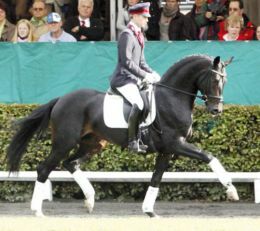 This amazing stallion went on to win the 2009 and 2010 Bundeschampionate Finals in Warendorf which is an historic achievement. He also competed at show jumping as a 4 you and won his class. Lissaro van de Helle has a phenomenal, relaxed, extended walk with much overstep. He has an energetic trot, actively engaged hind leg, and brilliant up-hill canter with good length. He has much collection and self carriage and tremendous rideability. He leaves an impression with his super attitude and cool, relaxed manner. He is now ridden by Wolfhard Witte at Celle.